With the rise of online fundraising many organisations might think the days of tin-rattling are over. This is not true. TAKEAWAY: Sending out volunteers with collection tins, or setting up tins on the counters of shops, cafes or bars, is still an incredibly effective way to raise funds. Here's a list of places where you can find exactly what you need. The Collection Box Company sells a range of plastic and cardboard fundraising collection devices, including buckets, boxes and dishes. The company can only distribute products to registered charities or welfare organisations (not individuals or consultants), and products are available for sale only (hiring is not available). Collection Box can only provide quotes once it knows the colour, quantity and finish of the required product due to the large number of variations available. The company suggests organisations join together to make a larger order so they can benefit from reduced rates. 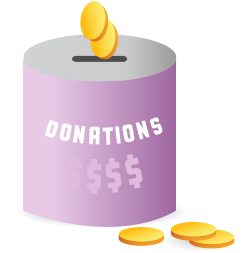 POS Displays offer a small selection of donation boxes, and also offer buyers the ability to design custom boxes made to their specifications. The custom built items can be manufactured using metal, acrylic or timber materials. The privately owned and operated Australian company offers in-house printing to customise your displays. NCI Packaging sells both plastic and metal collection tins in two different sizes. Orders can be made both for individual tins, as well as bulk orders of cartons or pallets. PMG Engineering Services is a Victorian company which offers an attractive and affordable range of plastic collection containers with either "quick drop" lids - ideal for collections from motorists and pedestrians - or the more traditional "coin slot" lids. The minimum order is for 10 containers and 20 lids, and each comes with a tamper evident seal for security. Ability Works Australia is a long time supplier of collection tins. The Ability Works website has information and links to prices - the minimum order for collection tins is $24, with prices starting at around $4.40 each. Located in Shenzhen, China, Yakri Crafts offers a range of acrylic donation boxes in different styles and sizes. Orders can be made for single boxes or bulk amounts, with shipping costs depending on order size and destination. For pricing information visit the Yakri Crafts website and send through a request for a free pricing quote. Slimline Warehouse is an Australian business with a range of donation, raffle, and suggestion boxes in various shapes and sizes. For those looking for extra security, many of the boxes contain a lock. There is no minimum order, meaning you don't have to buy more than you need.